"Sampath Speaking" - the thoughts of an Insurer from Thiruvallikkeni: Magnesium in tap water reduces the risk of broken hip !!! Magnesium in tap water reduces the risk of broken hip !!! Trisha would ask on screen “Kya Toothpaste mein namak zaroori hai?” ~ does your toothpaste contain salt ? …..why it should contain and if it is so necessary, why their earlier products did not contain ? …. Pumpkin Seeds; Brazil nuts; dry roasted soybeans; wild rice; dried Coriander; dark Chocolate; flaxseed; sunflower seeds; molasses; dates; oatmeal; black-eyed peas ………. Wonder the grouping ?? The festival of lights is most enchanting and added colour are the fireworks … more than the crackers, there are beautiful fireworks like flower-pots, candles, wires, aerial shots which display lots of colour. Excluding propellants or special effects, the points of light ejected from fireworks, termed 'stars', generally require an oxygen-producer, fuel, binder and color producer. When the temperature of a firework is controlled, the glow of components, such as charcoal, can be manipulated to be the desired color (temperature) at the proper time. Metals, such as aluminum, magnesium, and titanium, burn very brightly and are useful for increasing the temperature of the firework. The name magnesium originates from the Greek. It is believed that in 1618, a farmer at Epsom in England attempted to give his cows water from a well there. The cows refused to drink because of the water's bitter taste, but the farmer noticed that the water seemed to heal scratches and rashes. The substance became known as Epsom salts and its fame spread. It was eventually recognized as hydrated magnesium sulfate, MgSO4·7 H2O. The metal itself was first produced by Sir Humphry Davy in England in 1808. For long I have heard of magnesium as differentiator in Sparklers (between Kambi mathappu and surusuru vathi) ….. Magnesium is a chemical element with the symbol Mg and atomic number 12. It is an alkaline earth metal and the eighth-most-abundant element in the Earth's crust and ninth in the known universe as a whole. Magnesium is the fourth-most-common element in the Earth as a whole (behind iron, oxygen and silicon), making up 13% of the planet's mass and a large fraction of the planet's mantle. The free metal burns with a characteristic brilliant-white light, making it a useful ingredient in flares. The metal is now obtained mainly by electrolysis of magnesium salts obtained from brine. In human biology, magnesium is the eleventh-most-abundant element by mass in the human body. Magnesium ions are sour to the taste, and in low concentrations they help to impart a natural tartness to fresh mineral waters. Scientists and the advice of Medical fraternity keeps changing in tune with time and technology…… here is the latest of how putting magnesium in tap water could help prevent hundreds of hip fractures each year….. excerpted from a post in Daily Mail UK based on Norwegian study which has found link between bone strength and magnesium. The post states that hundreds of hip fractures could be prevented every year by adding magnesium to tap water, according to Scientists at the Norwegian Institute of Public Health who have found drinking water with a higher concentration of magnesium helps with hip fractures, a common injury suffered by the ageing population of Britain (and elsewhere). Public health experts in Norway, where drinking water varies in quality widely, found that in areas where tap water contained magnesium both men and women suffered less hip fractures. Previous successes in adding different naturally occurring materials include the addition of fluoride to drinking water, which led to better dental hygiene across the country. However, the study didn't find a link between calcium in drinking water and the number of hip fractures suffered even though calcium is often associated with bone strength.The researchers have said water companies should add the mineral dolomite to public supplies, because it is rich in magnesium. The study, which took place in Norway, seems to point to a link between increased intake of magnesium and hip bone strength. It is the first time the link between calcium/magnesium and hip fractures has been looked at this way. The researchers compiled data from three sources; an earlier project on drinking water in Norway, the National Population Register with inhabitants in Norway from 1994 until 2000, and the register of hip fractures in Norway. These data sources were linked together to create a compilation of fractures in areas with the highest and lowest areas of calcium and magnesium. The researchers followed approximately 700,000 men and women over seven years and registered about 5,500 hip fractures among men and 13,600 hip fractures for women in this period. 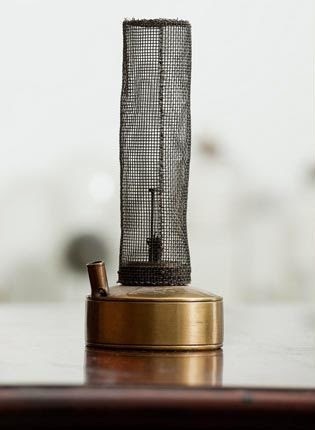 The Davy lamp is a safety lamp for use in flammable atmospheres, consisting of a wick lamp with the flame enclosed inside a mesh screen. This was invented by Sir Humphry Davy in 1815. 1) The group at the start (in blue) are some of the food items rich in magnesium.